Boccaporto is a combined seating and work unit developed for open offices and public areas. 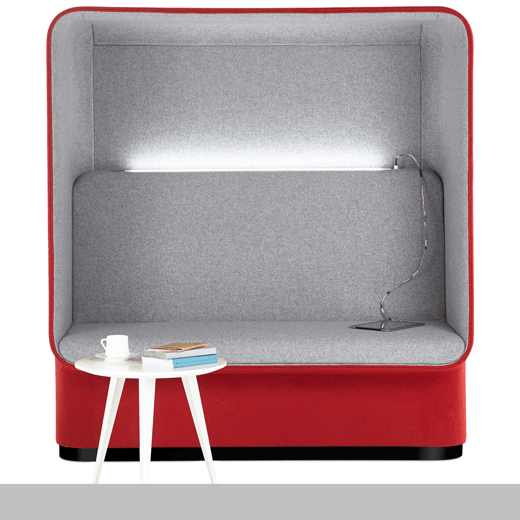 The cubby unit is a softened square shape with a cushioned hood to provide an isolated workspace for one to two people; it is versatile, working as a place for individual work or for collaboration. Inset power and lighting capabilities and vibrant upholstery options, elevate the unit, making Boccaporto a focal point for a range of busy spaces. This unique seating collection is modern in its aesthetic and technological deliverables, providing a station that is pleasing to the eye.